Vox.io, the sweet little alternative for Microsoft-owned VoIP juggernaut Skype, added instant messaging support earlier this year. But Skype still had an edge over Vox.io on that front after inking a deal and subsequently integrating with social networking giant Facebook. Today in London, the promising Slovenian startup has announced that it now up to par with Skype in terms of IM features, adding the ability for users to chat with their Facebook friends straight from Vox.io. 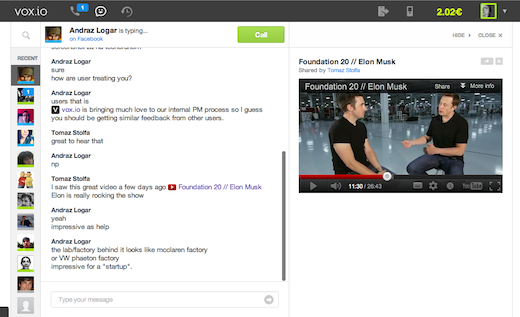 Vox.io chat, because it works within a browser, is different from the instant messaging functionality Skype users are familiar with in the sense that it support in-line media (compare it to the way Gmail displays YouTube videos inside emails, or how Twitter’s Web app handles shared Instagram pictures for examples). Today, Vox.io chat makes it easy to consume shared content from over 200 sources (thanks to working with Embed.ly), including YouTube, Vimeo, Soundcloud, Instagram and many more – while continuing the conversation. Starting today, Vox.io users can also start Facebook chat sessions whenever their friends are browsing Facebook, which, let’s face it, happens a lot. Voice and video calls between Vox.io and Facebook friends are also possible thanks to the former’s “quick call links”, which make it easy to start a call within a user’s browser with a single click. Vox.io, which is backed by angel investors and Seedcamp, says it recently signed up its millionth user. The company makes money when users make calls to traditional telephony systems, and by delivering SMS messages. The next step for the startup will likely be an expansion to mobile platforms other than iOS (the company already offers an iPhone app), with Android and/or Windows Phone as the likely next supported smartphone operating systems.